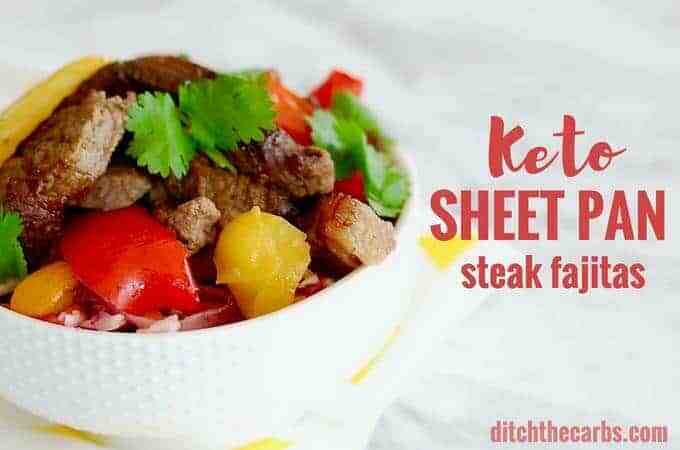 Cook up these Keto Sheet Pan Steak Fajitas and it’ll be up there with all the family favourites! 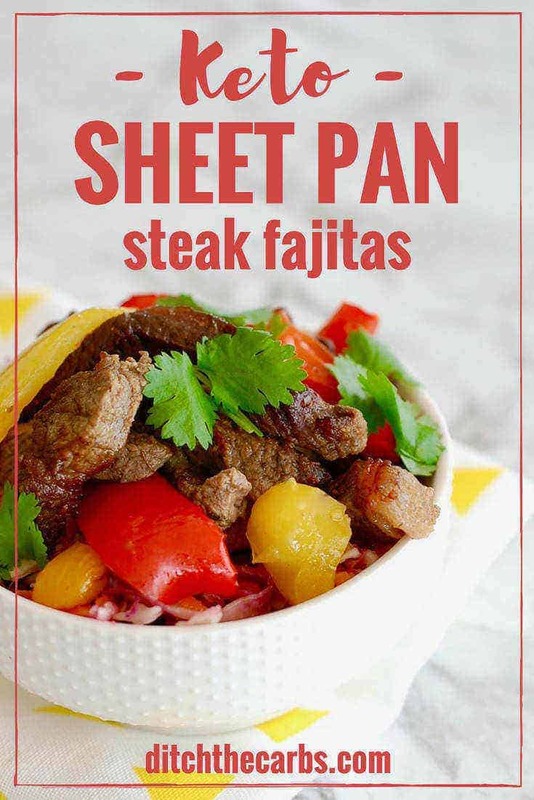 This healthy fajita recipe is really easy to put together, all in one sheet-pan. 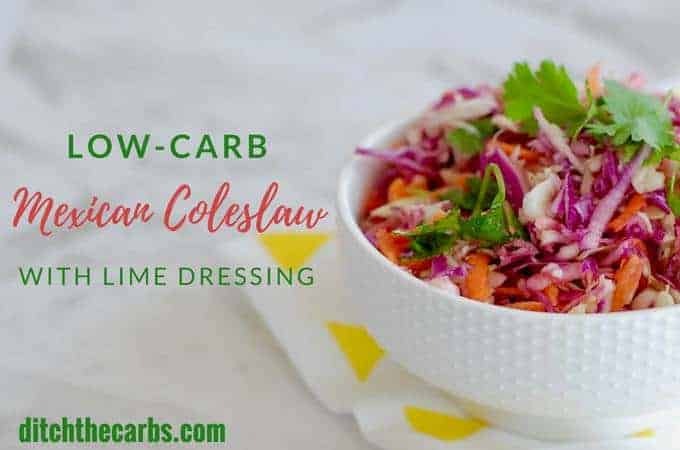 And read on to see the amazing Mexican coleslaw with lime dressing! Keto Sheet Pan Steak, por favor! The fajita is a Tex-Mex dish filled with little strips of meat cut from the beef skirt. 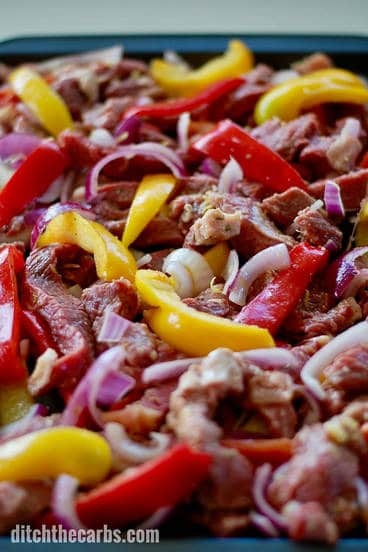 As time went by, people have become creative in making signature fajitas that they’re now made with different fillings not limited to the cuts of beef skirt. Originally, back in the 1930s, the beef skirt would be given to Mexican ranch workers (vaqueros) along with the hide, head and entrails as part of their wage for the day. 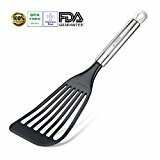 They made hearty dishes with what they were given which gave rise to the evolution of fajitas as we know them today. The term ‘fajita’ now describes anything cooked and wrapped up in soft tortillas, or served on a hot skillet. In this recipe, you’ll find out how I make it with steak and a sheet pan! 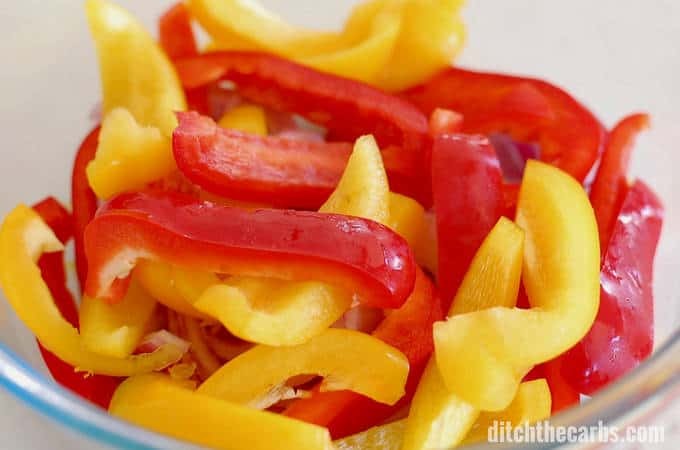 And yes, we can enjoy these healthy low-carb fajitas as there are no tortillas to worry about, which makes them a healthy recipe and a cheaper one too! Are you hungry yet? 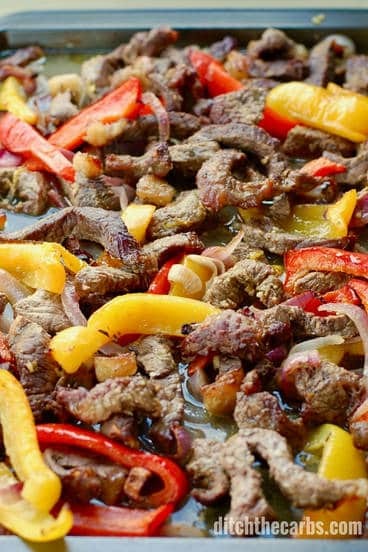 Once these keto fajitas start cooking in your oven (or even on the BBQ), your kitchen will be filled with the most amazing aromas. Try this Easy Keto Sheet Pan Meal! Serve the low-carb tortillas on a sheet pan, or on top of a bowl of my Mexican coleslaw salad with lime dressing. This fajita recipe makes for a filling and delicious Tex-Mex meal. Why not match it with low-carb drinks for dinner with friends? 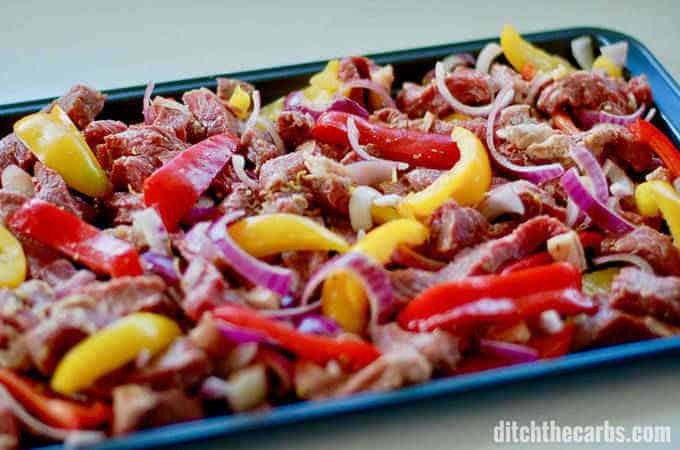 Give this vibrant, healthy and colourful fresh sheet pan fajita recipe a try! INCREDIBLE keto sheet pan steak fajitas. Just mix and throw it all in the oven, dinner will be ready in less than 20 minutes for the whole family. Mix all the ingredients together in the sheet pan/baking tray. Bake at 180C/350F for 15 minutes. Stir half way through cooking so the fajitas are cooked and mixed thoroughly. 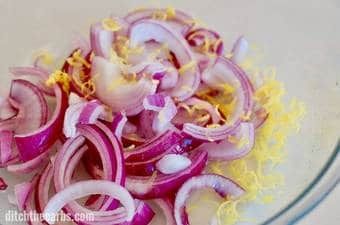 Serve on Mexican coleslaw with lime dressing, or on a simple green salad with lime juice and olive oil drizzled over. It sounds like you are cooking them for too long, I simply buy beef schnitzel or minute steaks. Both are the very thin cuts of meat. I can’t get the coke Slaw recipe to come up. What am I doing wrong? I just checked and the link works, but here it is again just in case. It’s soooooo good. What kinds of steak work best in the sheet pan recipe? Can anyone give me tips on making he crust CRUNCHY and crisp? Mine came out a bit soft and soggy, but taste was fine. I rolled fairly thin and cooked on parchment on my pizza pan. I did top with sauce and toppings as soon as it came out without letting it cool. Thanks in advance! Will make again with some suggestions for a crispier crust! You forgot the onion and cilantro in your ingredients list!! Whoops, I forgot the onion. Cilantro/coriander was just for garnish. Thank you for spotting this.